Having a password field in the settings, either in Connection or Advanced tab is useful. Currently, pwd is saved per host ip. But when using the cloud services - like AWS, Azure or GCP, the host ip keeps changing but I prefer to use the same password. Core Shell use the host address (IP or domain name) as the primary key when saving password in keychain. When we restart the cloud instance (launch, stop, start), both Public DNS(IPv4) and IPv4 Public IP address change. So we have to retype the password again. 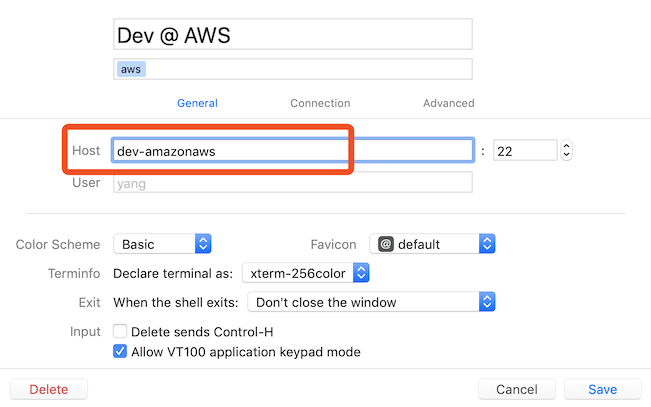 Core Shell would use the host name dev-amazonaws as the primary key when saving to keychain. Every time after you restart the instance, edit /etc/hosts and change to the new address, then execute sudo killall -HUP mDNSResponder to force macOS flush DNS cache so that Core Shell can use the updated IP. Thanks for the solution. It would be nice if this workflow is integrated in the Core Shell app itself. The previous version "SSH Shell" used to save passwords in the connection tab itself which was easy ! 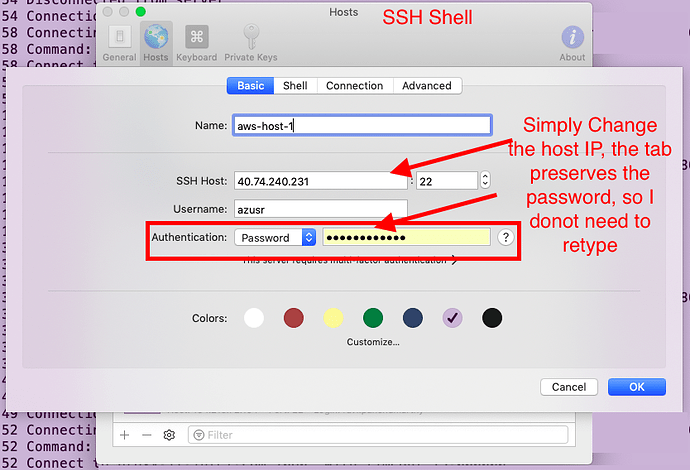 SSH Shell and Core Shell make no difference on saving passwords. Though you can type in passwords in host settings, but they still be saved in system keychain, and also uses the host address as the primary key to fetch back. This means you still have to retype passwords after IP addresses changed in SSH Shell. Another practical solution is to use public-key authentication, you don't have to retype the passphrase of the private key after IP address was changed. I might not be clear. Although both programs save passwords in the system keychain, SSH shell conveniently shows it in the UI, which helps in preserving when the hostname changes, so no need to retype. Yes, public-key auth helps, but there are few use-cases where I need to use passwords.